If you are looking for information on the Mazzio's Italian Eatery franchise business opportunity, Mazzio's Italian Eatery franchises or Mazzio's Italian Eatery franchising, then you have come to the right place. We are seeking motivated entrepreneurs worldwide! From recognizing trends, to focusing on our brand vision, we are passionate about delivering an exceptional fast casual Italian dining experience. For nearly 50 Years, we've been a leader in the category and we invite you to share in our success! Mazzio's is a fast casual Italian chain offering pizzas, pastas, salads and sandwiches for dine-in, carryout, delivery or catering. Nearly 50 Years of Operational Excellence! 63 Corporate Locations - We're not just the franchisor... We are operators too! Mazzio's has developed a culinary edge with our diverse product mix. Our menu appeals to a wide demographic, and attracts patrons seeking a high quality Italian dining experience at an affordable price point. We have full time culinary employees focused on new product development. 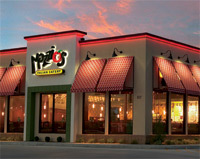 Mazzio's keeps our menu exciting and current with consumer tastes and trends! Each day in America consumers eat about 100 acres of pizza. That's about 350 slices per second! It's no wonder the $30 billion a year pizza industry is thriving. But tastes are changing, and consumers are demanding "better" quality products from all segments of the restaurant industry. Speaking recently at the 2010 Technomic Trends and Directions conference, renowned foodservice analyst Nancy Kruse remarked that premium crusts offer the glimmer of a pizza renaissance, citing Mazzio's artisan pizza offerings! Our Menu: Dine-In, Carryout, Delivery, Catering or Online! Beverages, Desserts & Kids Menu! Mazzio's Italian Eatery was recognized in Technomic's 2008 annual list of the "Top 45 Pizza Chains by Average Store Sales" and was also ranked 23rd on Pizza Marketing Quarterly Magazine's "Top 200 Pizza Chains in the United States". Additionally, Mazzio's was recently ranked in Chain Leader Magazine's annual "Best Places to Work" report due to its concepts' low general manager turnover rate (16 percent) and its depth of employee benefits. Mazzio's Italian Eatery has consistently won "Best Pizza" awards in its primary markets for many years and retains an industry-leading Customer Loyalty Index for Overall Satisfaction from SMG. Our team has put together a franchising system that will help guide and support our franchise partners every step of the way. From a national call center, to site selection and assistance with lease negotiations, to in-depth manuals and marketing programs we provide you with the training and tools for long term success.